Sheriff Keith Slape says a vehicle was reported stolen Sunday night and was recovered by Deputies a short time later. 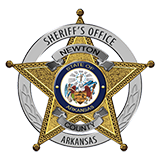 At approximately 7:55 pm Deputies were dispatched to the Piercetown area in reference to a stolen vehicle. The victim stated while at Carver on the Buffalo River the vehicle was taken. Deputies found the vehicle at a residence in Piercetown and arrested Ryan Scott Applegate 26, of Western Grove, for theft of property and Christopher James Levi Campbell 30, of Hasty, for an outstanding warrant.